But in reality, dramatic results don’t necessarily require sticker shock. We’ve covered cheap DIY star trackers before on Hackaday, but this design posted on Thingiverse by [Tinfoil_Haberdashery] is perhaps the easiest we’ve ever seen. It keeps things simple by using a cheap 24 hour clock movement to rotate a GoPro as the Earth spins. The result is a time-lapse where the stars appear to be stationary while the horizon rotates. Using a 24 hour clock movement is an absolutely brilliant way to synchronize the camera with the Earth’s rotation without the hoops one usually has to jump through. Sure you could do with a microcontroller, a stepper motor, and some math. But a clock is a device that’s essentially been designed from the ground up for keeping track of the planet’s rotation, so why not use it? If there’s a downside to the clock movement, it’s the fact that it doesn’t have much torque. It was intended to move an hour hand, not your camera, so it doesn’t take much to stall out. The GoPro (and other “action” cameras) should be light enough that it’s not a big deal; but don’t expect to mount your DSLR up to one. Even in the video after the break, it looks like the clock may skip a few steps on the way down as the weight of the camera starts pushing on the gears. If you want something with a bit more muscle, we’ve recently covered a very slick Arduino powered “barn door” star tracker. But there’re simpler options if you’re looking to get some shots tonight. [Zach] saw a stuffed animal that projected some simple stars on the ceiling. This gave him an idea that he could build a tiny star projector for his 3 month old daughter’s room. 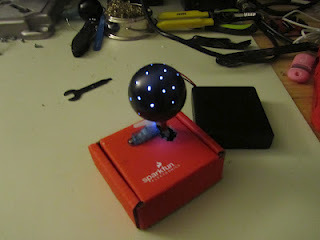 The idea is to put an LED inside a ping pong ball with tiny holes and rotate it slowly. The electronics are fairly strait forward. He’s using an MSP430 to control the servo and LED, allowing him to set different speeds and turn the whole thing off after a certain amount of time. The ball took a little bit of trial and error though. He first started by drilling some holes, but found this to give poor results. The holes were just too big. He finally ended up heating up a sewing needle and melting tiny holes in the ping pong ball. That worked perfect. After the break you can see a video of it moving. The servo is pretty loud, which might actually be a good distraction for a 3month old, but might be something to address in the future.